In this game, Sonic The Hedgehog finds himself out of his comfort zone in Mario World. The game is simple to play. Use the left and right arrow keys to move and the A key to jump. Throw mushrooms using the Z key. There are hidden worlds which can be accessed by entering certain pipes - don't miss them! 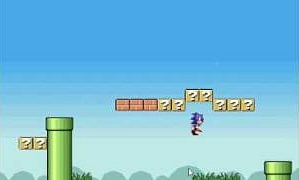 Can you help Sonic defeat Mario and escape from this nightmare world? The game is very responsive and is one of the best free online mario games around.